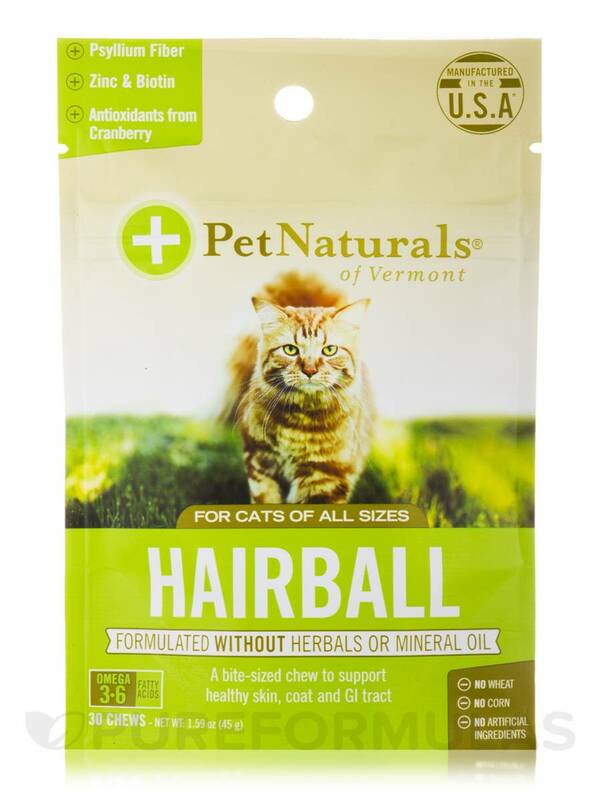 Hairball Chews for All Cats by Pet Naturals of Vermont has a very pungent, unpleasant smell. Each piece is quite large and a bit on the tough side. Only one of our two cats will eat them. 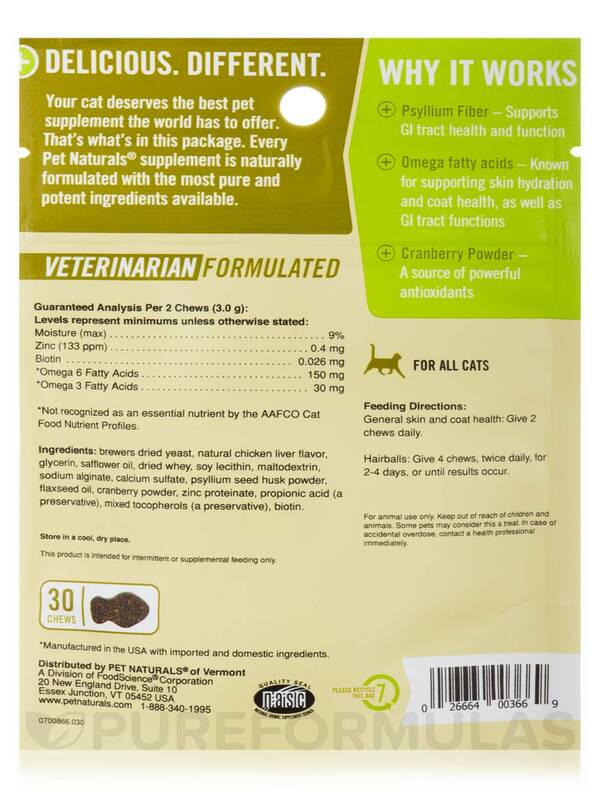 Your cat deserves the best pet supplement the world has to offer. That's what's in this package. 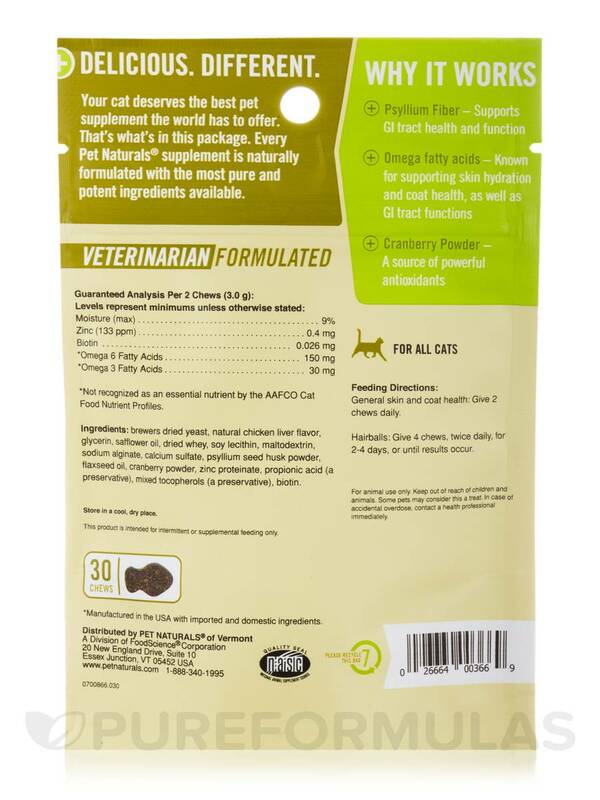 Every Pet Naturals® supplement is naturally formulated with the most pure and potent ingredients available. Ingredients: Brewers dried yeast‚ natural chicken liver flavor‚ glycerin‚ safflower oil‚ dried whey‚ soy lecithin‚ maltodextrin‚ sodium alginate‚ calcium sulfate‚ psyllium seed husk powder‚ flaxseed oil‚ cranberry powder‚ zinc proteinate‚ propionic acid (a preservative)‚ mixed tocopherols (a preservative)‚ biotin. No Wheat / No Corn / No Artificial Ingredients. Hairballs: Give 4 chews‚ twice daily‚ for 2-4 days‚ or until results occur. Some pets may consider this a treat. I received an email stating this product is back in stock, yet when I try to add it the the cart it still says I will be notified when it's back in stock. Please don't tell me they are out that quickly again!! Hello Lisa,Thank you for choosing PureFormulas.com.This product is indeed out of stock again i will request the ordering manager to order this product.Hope you have a happy and healthy day.